We take the time to get to know your business and goals through real conversations and design workshops. From brainstorm to execution, we strive to create an innovative end-to-end products that transform businesses that also resonate with their users. We specialize in mobile apps, responsive web apps, IoT, wearables, and virtual reality experiences. 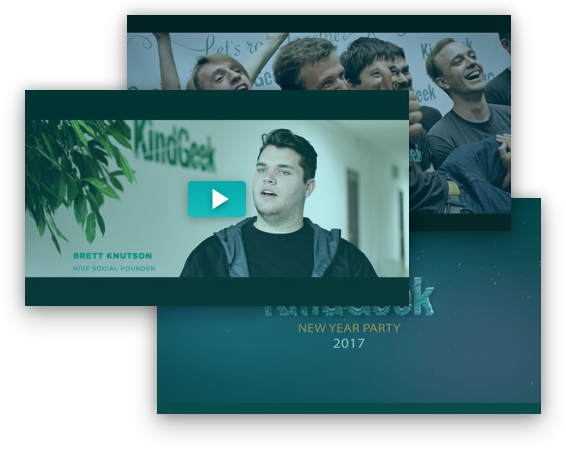 Brett Knutson, Hive Social founder, shares his experience of working with KindGeek.
" ...It is been an incredible experience for me so far and it`s been a lot of fun getting to work with everybody at KindGeek." Dominik Dresel, lehrermarktplatz.de co-founder , shares his experience of working with KindGeek.
" ...I am very happy with that cooperation, the communication very satisfactory the overall team spirit is really great..."
Chris Rael Partner Product Management at Tradeshift Adit Gupta Director of Business Development at Tradeshift share their experience of working with KindGeek. Tom Cape, co-founder of Grafter, shares his experience of working with KindGeek. "... with KindGeek we have honest conversation about challenges and problems and we have ability to work together to deal with this problem..."